Who's the Next (TV) President? The real race is on: Which TV president is better equipped for the job? Red state, blue state, maverick, change. It's all so much blah blah blah. But there's one race no-one's talking about, and it doesn't have to do with the electoral college. Depending on the outcome of next Tuesday's election, somebody's career is going to change in a big way in the next four years. 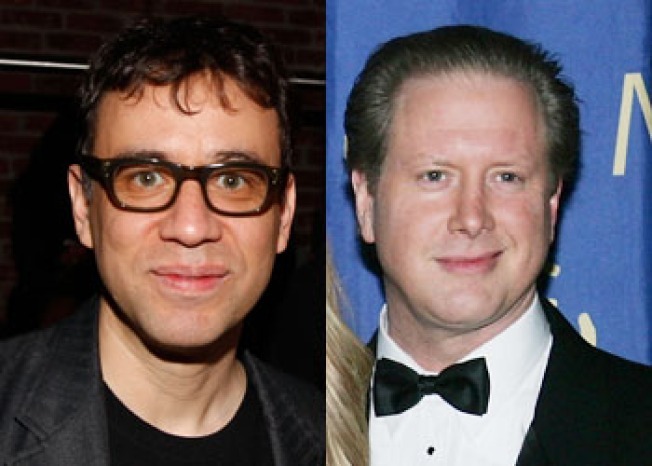 As Saturday Night Live's resident John McCain and Barack Obama impersonators, Darryl Hammond or Fred Armisen will be our next TV president. So who's better equipped for the job? Pros: Experience. At this point, Hammond is seriously old-guard -- he's the longest-running current castmember, with a whopping 13 seasons to his name. He has a lot of 30 Rock (the building, not the sitcom) in his pocket. Plus, as Bill Clinton, he's already racked up two terms as TV president -- arguably one of the best. The lip-bite/thumbs-up tic was an instant SNL classic, and we'd argue it led to the real W.J.C. doing both even more. (Or maybe it just made us giggle.) Also, we bet breakout castmember Kristen Wiig would make a mean Cindy. Cons: His McCain is just not on par with his other impressions (even his Jesse Jackson trumps it). We give the stiff war-injury posture a 6 out of 10. The voice is appropriately high and whiny, with a just hint of cottonmouth, but something's not clicking. Maybe hair and makeup needs to take another stab at the McCombover. There's also the veep issue: Will Tina Fey agree to keep moonlighting as Sarah Palin on top of her regular gig at 30 Rock (the sitcom, not the building)? Pros: His Obama is good. The clipped cadence, the rangy build, the level stare all work. And perhaps most impressively, he's managed to make his impression NOT about the fact that he's in blackface. Despite the seven SNL seasons under his belt, he still registers as young and fresh (if not quite in the Andy Samberg maverick league). And an Armisen win would mean more of castmember Jason Sudeikis' excellent Joe Biden (though we wonder how much of this is about the teeth). Cons: While Armisen's Obama is good, it's not exactly funny in and of itself -- which may be because the man he's aping hasn't done anything too laughable. Yet.